The Killi River, also called Killiyar, flowing in the Trivandrum district of Kerala, is the main tributary of the Karamana river. 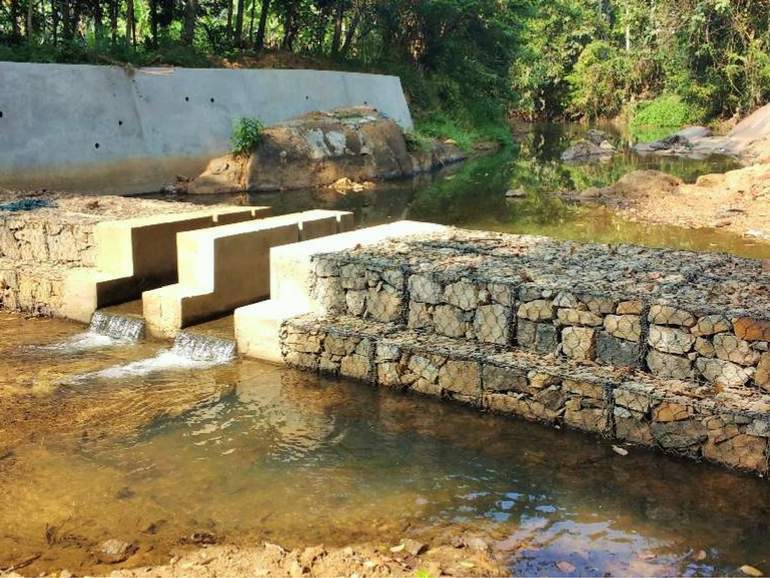 Our gabions and MacLine® Geosynthetic Clay Liner (GCL) were used to construct a check dam across the river to address the issue of water scarcity during dry seasons. The Kerala Irrigation Department decided to construct a check dam across the Killi River, aiming to recharge the ground water table and recoup the water level in the nearby wells adjacent to the structure, to solve the problem of water shortage during dry seasons. Another purpose was also to trap sand upstream of the structure and thereby restore the geomorphology of the river to the original river bed profile. To meet the client’s requirements for an innovative, eco-friendly and cost-effective solution, we proposed a check dam combining a gabion wall with a Geosynthetic Clay Liner to be placed across the central portion of the gabion structure, thus replacing other conventional measures, such as concrete (PCC or RCC). The gabion wall added flexibility to the structure, while the MacLine® GCL NL20 geocomposite functioned as an impermeable membrane preventing water percolation through the check dam. The GCL was sandwiched between the gabion walls to control the seepage.